Jury selection is underway in the trial that pitting server maker HP against its formerly strong software partner Oracle as they argue about the future of a technology that neither one of them controls: Intel's Itanium processor. Well, given that HP has been making payments to Intel to continue to develop the Itanium chips, at least according to documents that Oracle obtained during the discovery phase of the trial and released to the public two weeks ago, then we can say that HP had at least some say in the future of the Itanium. If HP had stopped paying Intel, Itanium would almost certainly be in mothball mode like Compaq's Digital's Alpha and HP's PA-RISC processors. There's inherently nothing wrong with paying a fab to make a chip. Advanced Micro Devices does it with Opterons, for instance, and so do zillions of other chip designers that are too poor to afford a fab and too smart to try to buy one. The difference, of course, is that Intel has been shepherding the development of Itanium since the initial "Merced" Itaniums from 2001 were co-developed with HP, using its EPIC explicit parallelism ideas; and really took over in earnest with the "Madison" Itanium 2s launched in 2003. The exact relationship between HP and Intel with respect to Itanium development was never divulged, of course, but the documents released by Oracle show that big-time sums, as high as $88m per quarter, were sent from Palo Alto to Santa Clara to keep Itanium afloat. This was only necessary, of course, because Itanium, which started out in the late 1990s with every major server vendor and every major operating system promising to make boxes and port their code to it, did not take over the world right alongside InfiniBand in networks and interface cards. By the time the current quad-core "Tukwila" Itanium 9300 processors were in development and suffering delays in the late 2000s, all but a handful of machines using Itanium that did not have an HP Integrity or Superdome brand on it had disappeared from the market. There have been a few entries, like Super Micro and Huawei Technologies, to be sure. But IBM, Dell, Sun, and Fujitsu all abandoned Itanium years ago. When Oracle bought Sun Microsystems in April 2009 and closed the deal in January 2010, Oracle and HP were suddenly in contention when they had been allies for the most part for 25 years. That HP chose former SAP co-CEO Leo Apotheker as its CEO when it fired Mark Hurd didn't help smooth over issues with Oracle, and that Oracle hired Hurd to be its co-president didn't help either. Oracle might well have been perfectly happy with the Plan A scenario above had it not bought Sun Microsystems and become a Unix and Linux system competitor to HP. 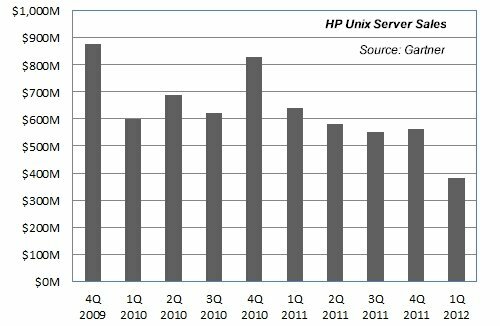 Since Oracle said it was going to stop development on its software for Itanium chips in March 2011 – and HP-UX is the only operating system that is basically left on the processor, with Red Hat Linux 6 not available on current or future Itanium chips and Windows Server 8 not going to be ported to them, either – what looked like Plan A for HP, to push forward with the "Poulson" and "Kittson" Itaniums and extend the life of the Integrity and Superdome lines to at least 2016 and beyond, has turned into something more like Plan B.
Oracle's actions have had a dramatic and swift effect on HP's Itanium sales, perhaps almost as steep as the decline that HP would have predicted if Intel and HP had come out and said Itanium was being mothballed. Oracle and HP have already said in public the arguments they will make in court. Oracle will contend that HP knew Intel didn't want to continue Itanium development and that its long-term plan was for Xeons to dominate the server base and that Oracle, as a key ISV, and its customers should have been privy to such information. But all server processor roadmaps are thin, at least the ones the outside world sees, and customers are almost never in the loop on what is going on - the documents leaked by Oracle make this all too clear. 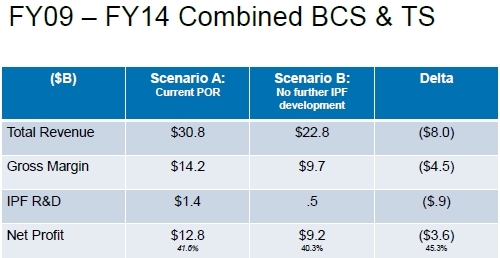 The Oracle Sparc roadmap goes no further than Sparc M6 at the moment in 2015, and IBM's Power8, due perhaps in 2014, is not exactly fleshed out. Intel is only talking very generally about its own Xeon chips in the future, and AMD is saying very little about future Opterons, too. HP will argue that Intel stands behind the current Itanium roadmap out to Kittson and that its settlement agreement with Oracle regarding the hiring of Hurd committed Oracle to continue to provide support of its software on future Itanium products. It would not be surprising if HP's lawyers try to argue that Oracle's moves to stop development of database, middleware, and application software on the Itanium chip actually caused HP economic damage. That's the thing about lawyers and trials. You can argue anything, just like you can sue for anything. But going before a judge and a jury is a bit like gambling with the future, perhaps even more than IT giants like HP, Oracle, and Intel are doing behind our backs all the time. It is hard to say what Judge James Kleinberg will do in the first phase of the trial, when he will decide whether or not HP and Oracle had an Itanium development contract, or what a jury in Santa Clara County Superior Court will decide in awarding damages if the judge says there was a contract.